We've been clearing out some storage spaces here. Lots of pitching going on. I saved this little canvas boat bag from the last load. (Big blue Ikea bags are awesome collecting bags for the church!) Polka dots. Add a little orange and it's perfect, but perfect for what? I've got a million bags! So I justified the Keep by giving it a job and now it's my current stitch bag - the right size to grab and go when I'm rushing out the door. This week, my mom had cataract surgery and we've been at the hospital and doctor's offices daily with pre-op testing, the surgery, and now post-op follow-up. Amazing how they have improved that procedure! It all went very well and she's doing great. 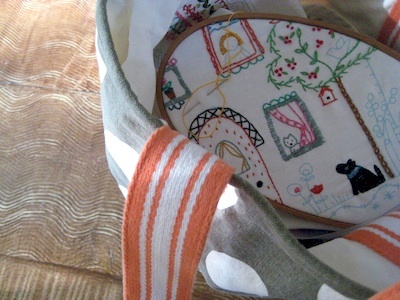 But thank heavens for the stitch bag! Among other things, I'm working on Jane's birthday gift. Isn't her Ben sweet? I just stretched the tail and filled the silhouette to make a black lab. How we all loved that dear old dog! I saved the roof for the surgical waiting room. Changing colors and stitch patterns keeps it interesting. When I finished that first row of feather stitch in brownish-red, it was kind of bland so I chose another pinkish-red and went back over it in the opposite direction. I'd never done that before, but I love the way it looks. Those little asterisk stars are stitch favorites too. 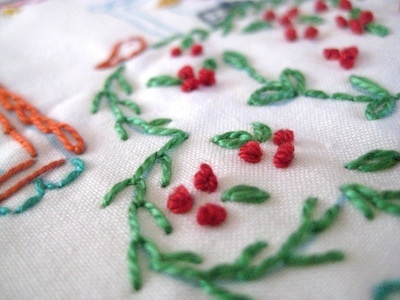 And French knots- adore those. Just the thing for Jane. Her maiden name was Cherry! Do you have a favorite stitch? Any little tricks to share?